Decent. My main complaints are (i) because of cooking in separate dishes, the rice and protein flavors don't blend, (ii) the dish is a bit drier than paella should be, and (iii) there isn't enough vegetables (needs more red bell pepper and peas and the like). 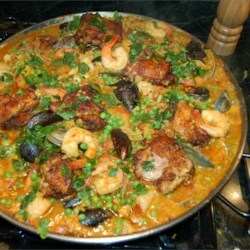 I much prefer the Paella I recipe on this site. Not only does it taste better, but it's actually easier to cook (requiring no marinating time and only one pan on which to focus). It's also easier to drop ingredients from a good recipe than figure out what to add to a okay recipe like this.